Gunshots in Sniper Elite 4 can be deafeningly loud, sometimes almost instantly revealing your location to the enemy. And while you can make use of the fairly rare Suppressed Ammunition found across the map, there do exist a few ways to mask the sound of your gunshots without it. Every so often, enemy planes will fly overhead during the game’s levels. These planes only serve to create temporary periods of loud noise when they pass by, allowing the player to fire off their weapons without the risk of ever being detected. This is however very random, and there is almost no guarantee that a plane will always go by when you need it. The second method is slightly more reliable, and makes use of generators like the one seen below. 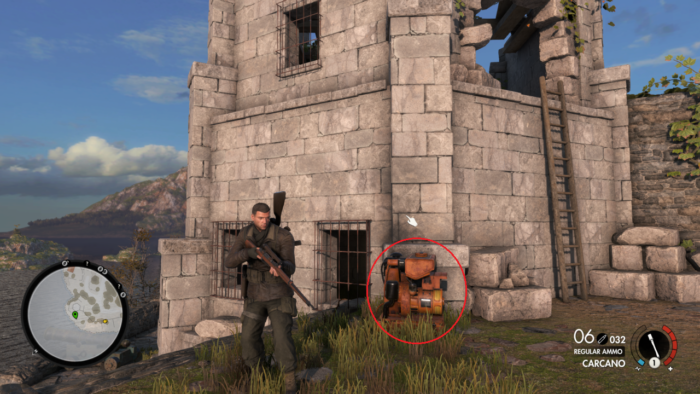 These generators can be found strewn across the maps in various different locations, some of which just happen to be very convenient sniping spots, and can be used to create noise on demand. Simply walking up to one and kicking it will cause the device to emit a constant stream of noise, giving you ample opportunity to snipe without being heard. Unlike the planes however, the generators are stationary and can only be used within their specific areas. Similarly, these sources can also be used to mask the sound of other loud noises such as the player running past enemies.